Cornwall based visitor attractions consultancy, Flamingo Marketing has expanded to include a talented Head of Creative Engagement, Mark Reid. Joining the small professional team, whose offices are based in Newquay but servicing clients throughout the UK, Reid brings a wealth of interactive creative knowledge offering an impressive resource for Flamingo Marketing’s existing client base. With a broad range of ‘on-the-ground’ and ‘behind the scenes’ experience from theme parks to West End musicals, scare schools to television, character creation, scripting and performing living history / street theatre . His extensive knowledge will enable him to increase the offer to clients adding a valuable dimension to the creative team. Nikki Smith, Managing Director says; “We are really pleased to develop our team to include this brand new role. Mark’s vast experience of theatre and performance brings a great USP to our business. We have found over the past few years that attractions are keen to engage more and look for ideas on how experiences can be enhanced. 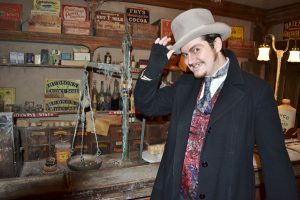 Mark is ideally suited to help with the development and delivery of entertainment and talk programmes and one of his first roles since joining us has been to test the added value of a living history character at the Victorian Village in Flambards over the Halloween Half Term period. Meet Mark – in one of his hands on roles.